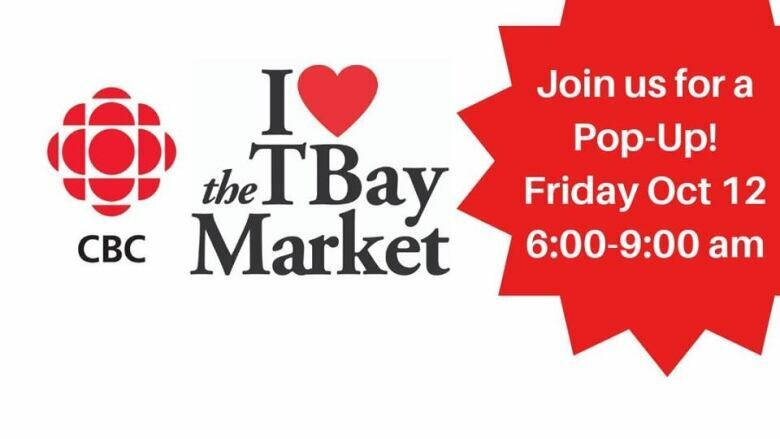 On Friday, October 12 from 6 a.m. to 9 a.m. the CBC's Superior Morning will be broadcasting live from the Thunder Bay Country Market. The show will be hearing from various vendors and people can also enjoy a performance from local country music singer Scott Van Teeffelen. On Friday, October 12 from 6 a.m. to 9 a.m. the CBC's Superior Morning will be broadcasting live from the Thunder Bay Country Market. The CBC Radio morning show for northwestern Ontario will hear from various vendors, and people can also enjoy a performance from local country music singer Scott Van Teeffelen. Join us at the CLE Dorothy Dove building, bright and early for your chance to win some CBC swag, meet the CBC's Superior Morning team and take home a prize basket full of local goodies from the market. It was a busy September for the CBC's Superior Morning, with a total of 16 pop-ups across the entire city, with host Lisa Laco and the CBC crew broadcasting from a variety of community organizations and coffee shops.